Peak Tone 6 holds the Intention of Flow by establishing a Rhythm and Pattern of Movement. Everything we learn is built from the Higher Ground of the new Understanding we carry forward. In the previous set of “Dark” and “Light” trecenas, between the Deer/MANIK and the Sun/AHAU, we were given a Direction for a Mission of Love, and Light to See the potential within our Self to carry it out. We were motivated and shown the Authority we were given to manifest the Creation. Flint/ETZNAB is a Flash of Truth, said to be delivered along the path of a “lightning strike.” Flint is the Sword of Truth, illustrated as a Sacred Implement of Healing that cuts to the Heart. Like “struck flint” it creates a Spark. ETZNAB represents the Spark of Human Intelligence to Discern the Truth. We thought the Eyes were the most beautiful gifts, though they were given for the Greater Purpose of Beholding Truth. Able to see the Truth all around, into the distance, and beyond the Light and Dark, we would be Happy. There would be no more suffering. We could see and walk the path BETWEEN the Darkness and Light. 6 Flint/ETZNAB, Kin 58, is a Portal Day that presents a thinning of the veil. Flint’s Truth may be Revealed as a sudden sense of Intuition or Knowing. Today we will face a new Truth about our Self. Made crystal clear, the Truth brought to Light will change the way we see ourselves and others. The Reed/BEN trecena is the next “Light” that inspires the Gifts we would bring to each other to be shared by a Divine Family. Reed is teaching us how we would lead in the position of an Elder, a Mature Deer. The Deer’s most important Spiritual Tool is Vigilant Observation. The Elder Deer stands with a foot in every direction, upholding the Pillars of the Spiritual Kingdom. Through the climb prepared by Reed/BEN, we’ve been given the One Eye that can see clearly all around, far off into the future in the Dark or Light. We are given the eyes to see that ALL experiences were created to be seen by the One Eye that will see no darkness or light – only the One of Everything. Everything we’ve experience so far in this trecena was leading to today, when it would all be drawn together for a Divine Moment of Truth. Master Number 66: Number 66 is comprised of the vibrations and energies of the number 6 doubled and amplified. Number 6 carries all the attributes of service to others, home and family, domesticity and social responsibility. Number 66 is a Divine Message from the Angels to put your faith in the Goodness and Benevolence of the Universe where all our needs are met. It’s a message to hold Divine Thoughts. When Number 66 appears, it is the Sign of Angelic Support. This is a day to be open to receiving and accepting help and assistance from our angels, the spiritual realm, and other people in your life. Angel Number 66 delivers a message that all is well in regard to your home and family, and to Enjoy your Life and the Companionship of those close to you, and to share your love freely and unconditionally. The Master Number 66 is in keeping with the Intention of Tone 6, and the Spiritual Momentum we create when we employ our Divine Vision. Tone 6 is compared to the energy of a great athlete, that draws all its teaching, practice, and skills together for a race to the finish line. Tone 6 is the Beauty of a Dancer who learned and practiced every step, to give a performance that was transformed into an Expression of Art, where the lines and beauty are drawn by the body through a dynamic movement that speaks to our heart. I learned something new from our Dear Daykeeper friend, Jen, in Guatemala. She’s half my age with so much direct Wisdom to share from being guided by the Elders there in a very personal and concentrated experience. Jen’s teaching was completed through offerings she made at the physical altars that exist in Guatemala near Lake Atitlan. She received the Sacred Beans given to a Daykeeper when the work was completed. There’s something very special about the way the Maya experience the Tzolk’in as a way of life. The proceeds of my art are divided among MayanMajix and Jen. She is the point of Light in Guatemala through which I’ve been given a way to pay something back and Honor a Light that shines for all of us, prayers offered at the very altars of the Maya. Jen is a Sister and Mother to all of us as the Divine Discernment of 11 Crocodile/IMIX. We were talking about the two sides of consciousness, which I have described as the “lower and higher consciousness.” We were talking about the process of trying to understand and connect with our higher self. She explained a Higher Point shared by her Elder, one she illustrated with two lines that make a triangle, a horizontal line with a vertical line at the center. Her Elder taught that we are not to see “higher” or “lower” in our self, at least not from a perspective of “better” or “worse.” Instead, we honor them by using them simultaneously, together. Adjusting vision by drawing the two together, we rise to the Consciousness of Divine Vision. As I put this illustration of the two lines together, and enclosing it as the triangle, a familiar symbol presented itself. The symbol of Enlightenment and Illumination. The Weekly I-Ching from Bobby Klein, shared a similar message about suffering and “the struggle.” The guidance was to cast these words out of our vocabulary. When we focus our Divine Vision, there will be no more suffering. Instead of seeing good or bad, dark or light, pain or pleasure, we can imagine these experiences as adjustments of Divine Vision. Bringing Truth into focus. It takes both Human’s eye and Spirit’s eye to see it. One side of our Self is no less Divine than the other when the Whole of the Two are Brought Together as One. Just like Human, our most Divine Creation for the experience of Unconditional Love is manifested when we’re brought together In Love. Today, Flint/ETZNAB uses the Divine Eyes that have both been focused in the same direction, to present us with the Divine Truth we were meant to see. Flint/ETZNAB is a Day Sign of Unexpected Truth, yet it’s Truth we already know. Flint makes us Conscious of the Truth we See. Today, we’ll see the Truth we already knew without the need for any further supporting evidence, except for the Truth that we saw it. Flint strikes a Spark. With every Divine Spark, we receive the gift of “lightning in the blood,” that bestirs the Blood to Speak. The Maya define this Spark as our Sixth Sense that is generated directly through the heart. Every Flint day strikes a Spark, offering the Wisdom to Know what Our Truth actually feels like. Pay attention to your own experience of “Knowing that you Know.” It will awaken the Gift and Multiply it to Abundance. “Knowing that you Know” is the Vision of your Divine Eye. The purpose of Flint’s Truth is to help us see through an illusion. Sometimes we’re afraid of the Truth, afraid of the Movement it may demand of us. To live in the Integrity of our own Truth, we have to see it and we have to stand on it for our direction of movement. We’re afraid that if we see the Truth, then we’ll have to do something we’re not ready to do, or maybe we think we don’t have the power to do. Flint provides Truth to Set us Free. We will never be shown a Divine Truth that we are not already prepared to handle. Truth, itself, will be its own Source of Power. Flint exposes Hidden Truth and Truth that’s been covered up. No illusions can exist in the Light of Flint. The Day Sign is also called the Mirror, like the Obsidian Mirror, that ALWAYS reflects the Truth. One of the Divine Gifts of those born Etznab is this reflection of Truth. Don’t ever expect a false truth to get past Flint. When you speak a false truth to Flint, you’ll see that the real Truth is known by looking at their face. The reflection of “knowing we know” will be written all over it. Flint is said to present temptation, a day when we’re most likely to “act out of character.” Like a flash, in a knee-jerk response, the truth hidden flies to the surface. We’re given two ways we can “learn our lesson.” We can either pay attention to our thoughts and learn without consequence, or we can play it out and learn through the consequences. Either way is Divine. Either way, we are learning to draw our two sources of Spiritual Vision together. The purpose of Flint’s Truth-telling is like a clearing of karma. It raises Truth to sweep old illusions away. It focuses our Divine Vision. There’s no telling what Flint’s Truth can be. But we’ll know it when we see it. Flint’s Light of Truth can present the Illumination of Darkness or an Illumination of Light. Flint is equally known for delivering a “strike of genius.” That dream, the one we could see as a speck, might download in full-color. A dream that had yet to reveal a way forward, could come to us as a completed set of architectural drawings that outlines the plans for the creation, as clear as a bell. Truth is Always Divine. To all my relations, may we consider how Truth is a Divine Thing. For all our illusions and fears to know it, when we do, it makes the way Clear. Our illusions are always worse than the Truth when we know it. May we see how using two eyes together, just as illustrated in Human’s physical form, we have the Vision of Depth Perception. The two together will see farther and clearer than either Eye on their own. May we consider the Truth that the Eyes of Humanity were created to help us see together. Each one of us holds a Light unseen by the other. When we bend to the Divinity and Light held in each one of us, we hold the advantage we could draw from the Truth of many eyes, the Eye of the Whole. Instead of competing between Truths, we’d draw all the Light we could that’s offered through one another. We need each other to See the Highest Truth about the Whole. With Time, we’ll see that what we recognize as Truth, the “knowing we know” is a Truth that every one will recognize as “One and the Same Truth” we see from different perspectives. Seeing together will offer our greatest Depth of Perspective. May we be Vigilantly Conscious and focused to Receive a Divine Truth. May we use the Divine Vision to see as many pieces and parts of it as our eyes can take in. May we hold Gratitude for a blessing on the way that will clear that path to the Consciousness of our own Divine Vision, the Gift that facilitates the “knowing we know,” experienced through each and every one of the Spiritual Gifts of Knowing – our telepathy, intuition, clairvoyance, precognition, healing, and ALL gifts of Light. May we be Grateful for a Truth that will be shared with us, that will help us see a manifestation of Creation as if it were right before our eyes. May we give thanks for a Sword of Truth that cuts falsehoods away. May our Dance be like all the Love drawn together. May we not lean to one side or the other, but Whirl in the Dance that was offered in perfect balance at the Center. May our Eyes behold the Truth that Everything is Beautiful when we see it in the Balance. May we see our Self as the Lights of Many Dancers. We are swirling together, illustrating an Expression of the Creator’s Light, seen in the realm of Spirit as a Swirling Vortex of Light that gathers all the Lights into the Dance of Divinity. 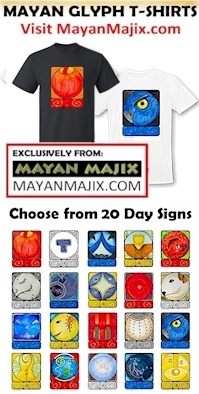 One of the Sacred Ceremonies of the Maya is a count of “21 Days of Gratitude.” We’re 2 days short of 21 days to the Haab New Year, February 20, 2019, but it’s never too late to start. Jaguar footprints led me here. There’s a little bump before we get there. The 5-day Wayeb, when it will seem like nobody’s in charge. (The Maya stay close to home. There is no Year Bearer in this short transition. So it may sense we’re a little on our own.) I’m counting my Blessing thru to the New Year. I’m grateful for the Creator’s Intention to Connect us all in a Right Relationship of Harmony and Equity. I’m grateful for the companionship we are given in one another, and all the Light and Wisdom that can be shared among the Whole. I’m grateful for the Flow of Spirit we enter and the Truth that helps us let go of where we are to enter the Vortex of Light that carries us heavenward into the One Light that Shines for ALL. Cherokee, Flint/DAWI’SGALA: Mirror, flint. Ability to discern deception and mirror it back to the other. A catalyst for change through this ability. When used properly, harmonic resonance can be the result. If you take on anothers issues through the mirror, the result will be anger, grief and misunderstanding of purpose. All issues will surface and be mirrored in this earth walk. Energy comparable for teaching, leader, philosopher, writer, observing the mass consciousness evolution in some manner.